The American company Black, Starr & Frost is renowned for its exquisite Art Déco jewellery. 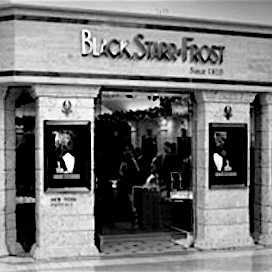 Black Starr & Frost holds the prestigious position of being America’s first jeweller, tracing its roots back 11 generations to a small store called Marquand & Company, which opened in New York in 1810. They were one of the very few American retailers to exhibit at the Great Exhibition at The Crystal Palace in London in 1851. The name of the company changes frequently as new partnerships are formed, with the current name of Black Starr & Frost being formed in 1876 when Mr Black took two new partners, Cortland Starr and Aaron Frost. They open a shop on 5th Avenue, after the firm moves on from dealing in various luxury items and focuses on producing jewellery and silverware in-house or imported from Europe. They swiftly acquire a prestigious clientele including royal families and dignitaries from both the United States and Europe. The firm is recognised for producing exquisite designs for every era, for example their bold Art Deco pieces, which were featured in the 1939 New York World’s Fair. The New York flagship store has since closed down, but Black Starr & Frost continue running the business from their California location. Das amerikanische Unternehmen Black, Starr & Frost ist bekannt für seine erlesenen Art Déco Schmuckstücke. Black, Starr & Frost gilt als der erste Juwelier Amerikas, gegründet 1801 von Marquand & Paulding in Savannah, Georgia. Isaac Marquand eröffnet das erste Geschäfte 1810 in New York, am Broadway. Als einer der wenigen amerikanischen Juweliere, stellt er 1851 bei der Weltaustellung im Londoner Kristallpalast aus. 1860 ändert sich der Geschäftsname in Ball, Black & Company. Es wird zum bekanntesten Juwelengeschäft in New York mit namhafter Klientel, darunter europäische Königshäuser und hohe Würdenträger Amerikas. Sie spezialisieren sich auf Schmuck und Silberobjekte, die in eigenen Werkstätten produziert, aber auch aus Europa importiert werden. 1876 geht Black die Partnerschaft mit Cortland Starr und Aaron Frost ein und firmiert als Black, Starr & Frost. Ab 1929 findet sich die Firma Black, Starr & Frost-Gorham Inc an der 5th Avenue. Für die New Yorker Weltausstellung 1939 präsentiert Black, Starr & Frost kühne Entwürfe großformatiger bildhauerischer Schmuckstücke. Heute existiert nur noch ein Juweliergeschäft von Black Starr & Frost in Kalifornien.